I just love this little mini you chose to use as an avatar! This first one is similar to leslee's first choice above, but I think it is different enough, even if you both choose them. They just both look so cute, I think! I gave you Easter colours, but alas, no bonnet. Did not get your request until these were done and I was beginning to post all of the Easter avatars. If you still want an Easter bonnet, I can do that Let me know. what do you have to pick randomly from? I need a new look...it's a girlie thing..
Brandi, I just saw your previous post that you had something in mind for me...you doll baby you! thanks..
let me know tomorrow or the next day..looks like you have been really busy..
Last I had heard, you were not sure if you were going to use this avatar for Easter, as you were thinking of changing to a whole new avatar. But I went ahead and decorated it with a sparkly eggs for you, with and without extra streamers, just in case you wanted to keep this one. I went ahead and decorated the one you chose to use for St. Patrick's Day last week, just in case you want to keep her. If you would like something else, let me know, but I think he came out cool-looking, myself. teehee. Haven't seen you in ages, but just in case you are still around, Happy Easter! I just did a couple of coffee monkeys for you, one with the hat, one without. If you want me to work on your avatar, let me know. Didn't know which avatar you are wanting to use for Easter, so I await your instructions. If your Easter avatar is not here and you'd like me to decorate yours for Easter, just let me know. Leave me a post. 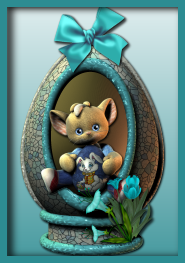 I think I have made Easter avatars for everyone that I have been making avatars for, but if I happened to have missed yours, and you want me to do one for you, just let me know, and I'll get right on it! And if you are new, I am always decorating for newbies, too! whew...now take a rest will ya? wow! now you do plan ahead girlfriend! tee hee! I spend hours on some avatars. And I just posted 44 or 45 different monkeys' avatars, and most have multiple selections. I think I'll rest tomorrow though. ...aw, so nice of you to say. I had fun and always do, with that walking cat of yours! Here's an Easter avatar if you want to use it. I was hoping to get a larger picture of your dog, but I went ahead and made this for you if you'd like to use it. OH BRANDI I LOVE THEM!!!!!!!!!!! THANK YOU SO MUCH. Is there anyway to get my bow to match my ears? If I am patient and say pretty please with nanners on top? If not, no worries - I love my hidden egg and my ears! Brandi..I sure am glad you LOVE to do this. I think I would be balled up in a corner about now,ripping my hair out!! Brandi, Thank you so, so, so much. I had a very hard time picking. The egg was so pretty. I went with the pink and bow but I may change it before Easter to enjoy the beautiful egg avi. You are so talented and I loved looking at all the other avi's you did. Thanks so much!!! Brandi, first thing I did when I signed onto SM this am was come to your thread to see what you whipped up for Easter.. I was so happy!! You are remarkably creative and I really appreciate your hard work and how thoughtful you are! Thanks! My avi's are beautiful, it made it difficult to pick one! thanks again Brandi, for all you do.. I changed the tint in the hippie glasses to a more Easter-y colour! I also have a few I made for you before you requested glasses. If you'd like to see them, let me know. ...and that Josef, he just begged to wear this Easter Bunny suit!!! What can I say, I love Josef. I love playing with this avatar. What can I say? Brandi....Kitten is ready for her Easter garb!!!! Brandi ~ Thank you so much for the work that you do. You are amazing! Holy crap, girl!!! These are cool!! Thanks!